Subjects and Themes(Dreaming): My Country & Emu Dreaming. Bore in Utopia in Central Australia. He led a traditional lifestyle and upbringing in the Central Australian desert, learning his Dreamings and cultural responsibilities. As a young man he worked as a stockman as did many Aboriginal men who lived on or near pastoral leases in Central Australia. An Anmatyerre man and highly respected elder Kudditji would often take young boys and men hunting emu and merging traditional hunting skills as part of their initiation as men. He began painting in 1986 and would sell his artwork to many local galleries in Alice Springs. Painting was not a career for him in the early days and it wasn’t until the passing of his sister that he began to paint more frequently. When he first began painting his style was consistent with the times and he would paint detailed artworks depicting Emu Dreaming and Men’s Ceremonial Dreamings. These paintings featured ranks of coloured roundels and other traditional iconography on a chequered or dotted background. From 1990 his paintings took a somewhat radical style using more abstract imagery and bold colours. Initially these were not well received by galleries however Kudditji persevered and eventually received recognition for this new style of painting. He uses a heavily loaded brush and a usually bright palette of colour. 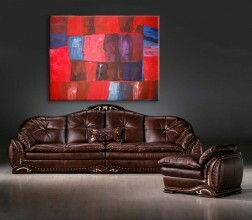 The paint sweeps broadly across the canvas with progressive blocks of stippled colour. 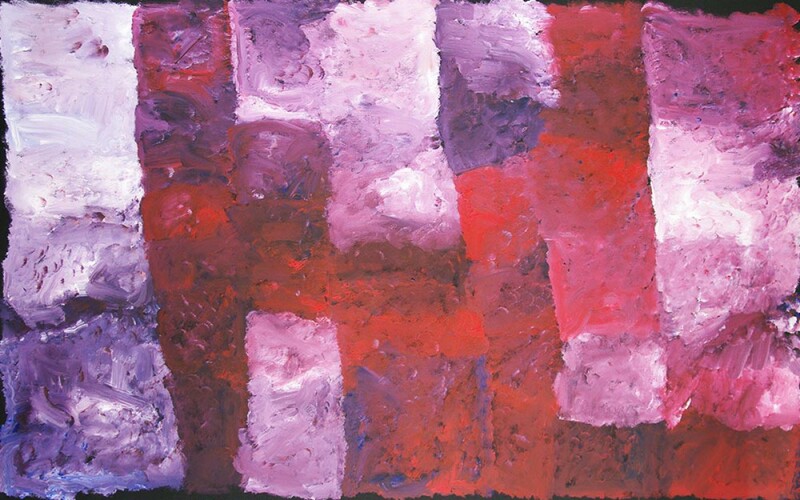 Kudditji’s paintings reflect a style he has become well known for since 2003 when he began to explore the “dump dot” technique made famous by his sister, Emily Kame Kngwarreye. 2012 “Kudditji Kngwarreye & Lorna Napurrula Fencer”, Japingka Gallery, Fremantle. 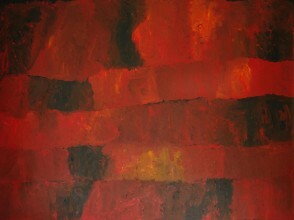 2011 “Kudditji Kngwarreye”, Kate Owen Gallery, Sydney. 2010 “Tradition to Modernity”, Central Art – Aboriginal Art Store, Tasmanian Craft Fair, Deloraine. 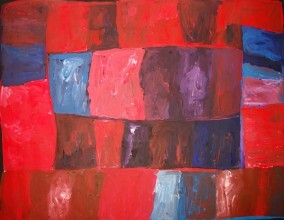 2010 “Kudditji Kngwarreye”, Kate Owen Gallery, Sydney. 2010 “Summer Collection”, Japingka Gallery, Fremantle. 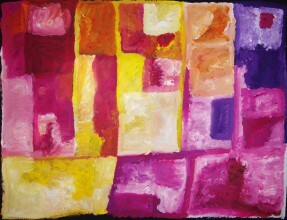 2009 “Kudditji Kngwarreye: Pastels”, Kate Owen Gallery, Sydney. 2009 “Kudditji Kngwarreye Feature 2”, Central Art – Aboriginal Art Store, Alice Springs. 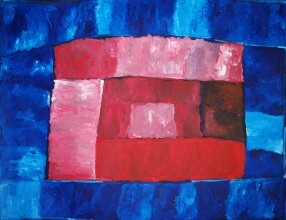 2009 “Kudditji Kngwarreye – Recent Works”, Japingka Gallery, Fremantle. 2008, “My Country”, Japingka Gallery, Fremantle. 2008, “From the Air”, Fireworks Gallery, Brisbane. 2008, “Blue: A Group Show”, Fireworks Gallery, Brisbane. 2008, “Black & White: Inspired by Landscape”, Kate Owen Gallery, Sydney. 2008, “Kudditji Kngwarrye”, Japingka Gallery, Fremantle. 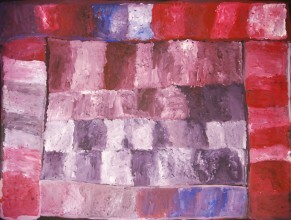 2008, “Kudditji Kngwarreye Feature”, Central Art – Aboriginal Art Store, Alice Springs. 2008, “30 Emu Dreamings”, Kate Owen Gallery, Sydney. 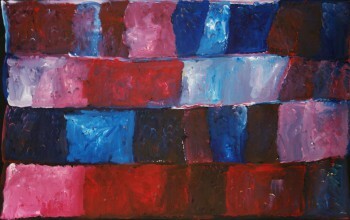 2006, “New Paintings”, Vivien Anderson Gallery, Melbourne. This magnificent artwork refers to Kudditji Kngwarreye's ancestral country of Utopia in central Australia. It also interprets men's ceremonial sites and Emu Dreaming. Kudditji is a traditional custodian of this country including Emu Dreaming and is the younger brother of the renowned artist Emily Kame Kngwarreye.